Here are over 40 65 chalkboard project ideas to inspire you to think out of the box. Today’s Take 2 Tuesday installment is a roundup of everything chalkboard ideas. I love a good repurpose, and making something into a chalkboard is one of my favorite projects. If you love today’s roundup, be sure to check out some other Take 2 Tuesday posts. Picture frames make awesome repurposed chalkboards. If you visit thrift stores, you can get great deals on frames. 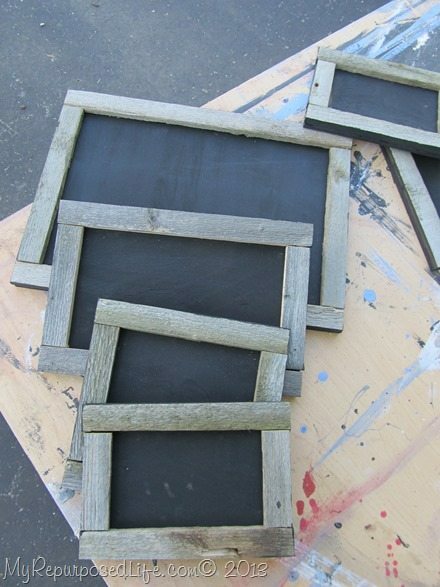 Why not check your attic or basement to see if yo have frames to turn into chalkboards. Did you know that you can even paint plastic picture frames? Do you paint mirrors? Personally, I prefer removing mirrors from thrift store items and replacing them with thin plywood. Dresser mirrors make fabulous chalkboards! What’s the oddest thing you’ve turned into a chalkboard? Using chalkboard paint is so easy. However, if you use chalkboard spray paint, the ideas are endless. How about repurposed beds and cribs? I love using them for all kinds of projects, particularly chalkboard ideas and coat racks. Have you ever used doors for chalkboards? What about cabinet doors or cupboard doors? Because they already have a routed edge, they make the perfect specimens. Maybe you have old side tables in storage? How about adding a couple of chairs? That makes the easiest makeover ever! If you don’t have something to repurpose into a chalkboard, why not make your own? These chalkboard ideas will have you thinking outside the box to make yourself a new chalkboard. So, you’ve made a new chalkboard, now what? Did you know you can use stencils and liquid chalk to decorate your new projects? Yes, there is this great project where you can use chalk paste to decorate any chalkboard surface or DIY sign. You might already have a chalkboard that needs refreshing. Have you been considering throwing it out? I hope these chalkboard ideas make you rethink that. If you have a large project, I recommend using paint from a can. I use Rustoleum. A nice foam brush works best for me. Store your foam brush for weeks in a plastic baggie-makes second and third coats go really quick. I do three light coats, first coat—side to side, second coat—top to bottom, third coat side to side again. A light sanding in between coats will make for nice coverage. Allow chalkboard to cure for 2-3 days, then condition your new chalkboard by laying the chalk on it’s side and covering the entire surface with chalk. Use a damp cloth to routinely clean your chalkboard surface. For small or numerous projects, spray paint is a great option. For colored paint, mix your own using one of the recipes below. Dampened chalk stick gives a nice crisp look to your writing. Mix well, smashing lumps. Use right away or store in a sealed container, using within a few days. This is my favorite way to mix chalk paint and/or chalkboard paint. The plaster of paris is easier to buy and cheaper than the non-sanded grout. I simply make a paste of the plaster of paris and water, then slowly add that to the amount of paint I’ve set aside for a particular project. I find that if you make the paste first, you don’t get a lot of lumps. Diane from In My Own Style has a great DIY chalk paint comparison in her post Testing 1 2 3 versions of chalk paint. Just leave off the wax step if you plan to use the paint as a chalkboard instead of a chalk painted piece of furniture. Have fun making some chalkboards! I’ve got to say, I am a big fan of the chalkboard, it has so many uses and my kids love them. Some really inventive ideas here to try! I love chalkboards too Gail! you have some great ideas! I do hope you do get some relief from you shoulder. Best wishes to you in the New Year. Merry Christmas and Happy New Year. I love chalkboards too, great ideas! I also enjoyed your other post when you delivered the christmas stuff, fun video! Wow, you sure are full of some fabulous ideas. I love them all, but my favorite is the room divider. Thanks for sharing all these ideas in one spot! Great list! My favorite is the old side table turned kid’s chalkboard desk. So cute. Love it all!!! You’ve been pinned…and shared on facebook! I think everyone should see all these goodies! 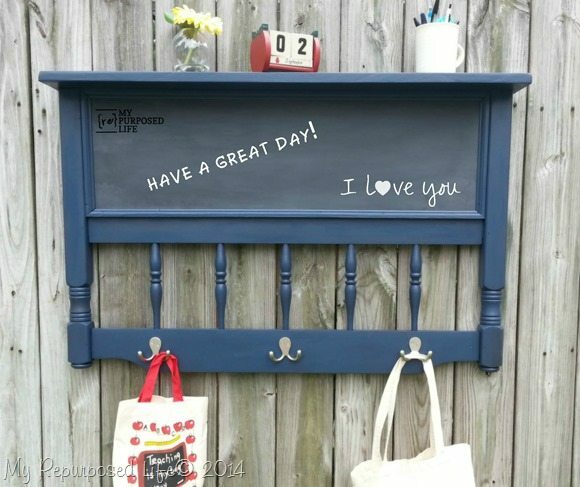 Great recap of all your chalkboard projects. I’ve only ever made two chalkboards and neither of them sold. Either they don’t get how cool they are….or they are making their own. HA!